Curation is now a skill much needed due to all the information we encounter on our constantly updated devices. Of course, we can choose the content and the amount, but that’s another story. 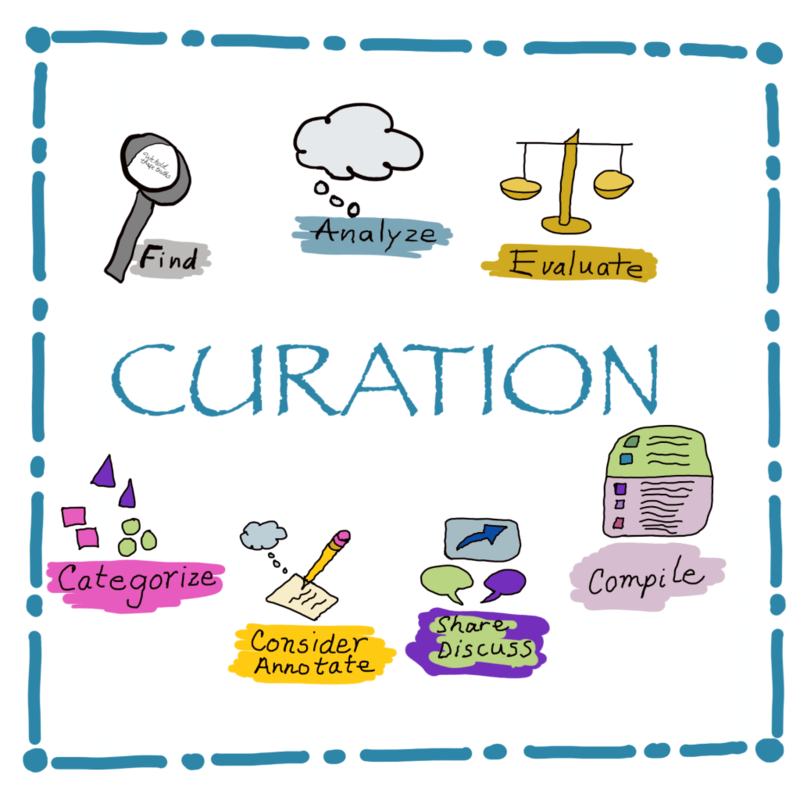 Curation is finding relevant resources on a topic of interest to analyze and evaluate for validity and content, categorizing each resource, considering its relevance and effect for the audience and purpose, and compiling it all with annotations so others can also view and discuss. Wow. That’s a bunch of thinking! 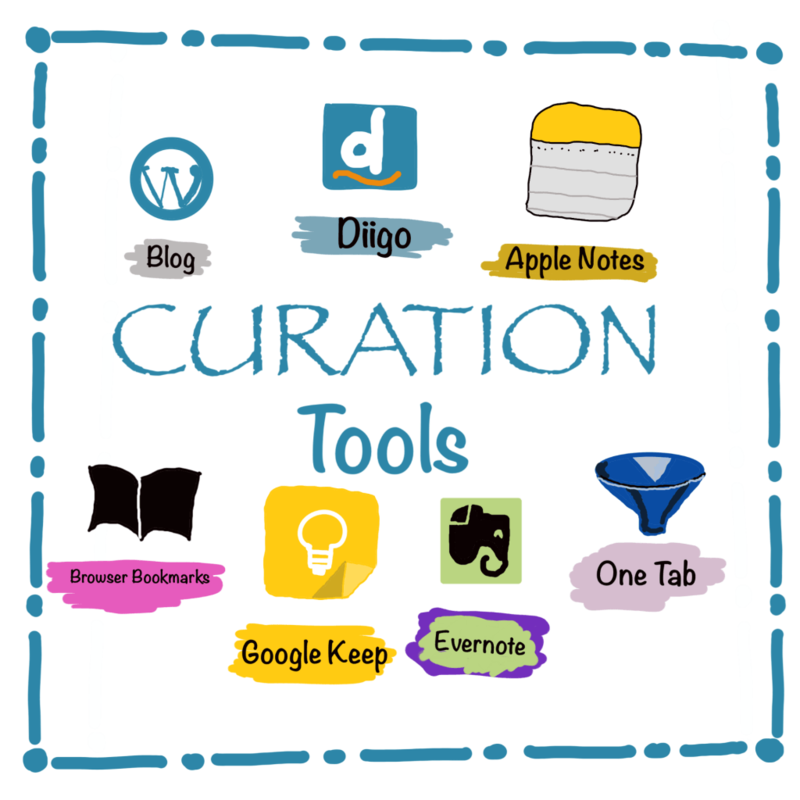 Edublogs posted an excellent resource on curation for one of its course: Step 6: Using Curation Tools as a Connected Educator. It’s a must read for anyone who wants to up their game in content analysis and reflection. Beth Holland wrote a wonderful piece in Edutopia for students: Take Note: How to Curate Learning Digitally. If we want students to make sense of their world in ways that will inform them with truths, then curation must be a part of our curriculum, and we must become examples in our own practice to model for them the benefits of learning to curate. As part of my goals for blogging, I plan to research topics I find interesting and relevant to education today that others will also want to discuss and learn. Researching topics helps build the momentum of blogging to keep ideas available for that next post. 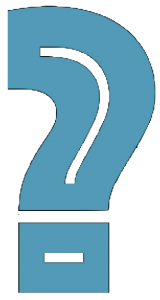 So, what do I do with the information I find? I curate with tools that fit my needs. People new to blogging may have a strategy in place for their other research, or they may want to know a few tools and strategies to get started in their quest to blog consistently. I hope this curation series is helpful. Apple Notes: Open on my desk top or device ready for — notes! Today, in preparation for this series, I learned a new tool called cMap from my friend Daniel Bassill who has been using the tool for awhile now. He recently shared this curation he created for 2018 using the tool to build a map of monthly work he’s completed as a community organizer to help kids. So, today I downloaded the free cMap application and started a search for resources about the curation tools I use most. I was able to create the map on my desktop and upload it to the cloud, so the links should also be clickable to you, in case you want to jump ahead with some information on these tools. I also hope to refine my process and perhaps get tips from my readers. So, won’t you join in on sharing your strategies for curating your own research? This series is a continuation of #blogging28 and my February Goals. Sheri, your idea of “goals for blogging” is brilliant! I have a doc where I keep a running list of ideas that I want to write about, but I’ve not set goals related to what I’m trying to do with my blogging. Thanks! Curation .. so important. This dovetails a bit to the first posts I was writing and thinking during MoDigiWri, where I was trying to find again an old conversation, and reconstruct the inquiry. Unfortunately, the curation tool had gone kaput on me. Luckily, I had my blog posts. In fact, of all the different tools I use for curation, my blog remains my most reliable and cherished archive. Hi Kevin — yes, our blogs hold a history we can review to remember context, our considerations, and others’ commentary. We can see our learning, how our ideas have transformed. It’s great that you have one main blog that holds your history. I enjoyed that post about the inquiry, and was glad that your review could be created using the information in your blog, which is truly a wonderful resource and a history of technology even! FYI: I’m having an issue with my commenting features: they’re set to post, but they are not posting without approval. Edublogs is working on it.